The content of this article provides interesting history, facts and information about Spoliarium. The bloody arena was the centre of a complex consisting of various buildings and industries necessary to 'running' the horrific activities of the Roman Colosseum. The complex of buildings, including the Saniarium (where wounded gladiators were taken) and the Ludus Magnus (where the gladiators were trained) were located in close proximity to the Colosseum and some, like the gladiator school, had direct access via a tunnel straight into the Colosseum. More large underground rooms, necessary for the services and the preparation of the shows, were made along the main axis of the Colosseum. The Spoliarium was part of the Colosseum complex. What exactly was the Spoliarium? Definition: The Spoliarium was a building or chamber where the dead bodies of gladiators were taken to be stripped of their armor and weapons prior to the disposal of their bodies. 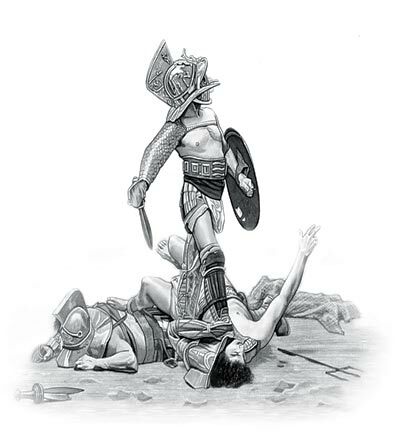 A gladiator could be killed by another gladiator or, in the case of the animal fighters, by a wild beast. Badly wounded , but still living gladiators (these were the noxii, who had been sentenced to death in the arena), would receive a fatal blow to the head with a massive hammer inflicted by a man dressed like Charon, the Ferryman of the Underworld. The bodies of the noxii gladiators would then be dragged from the arena sometimes by hooks in their heels, to make this chore easier. Their dead bodies were dragged through the Gate of Death called the Porta Libitinensis, This name derives from Libitina who was the goddess of funerals. The corpses of the gladiators were then taken to the Spoliarium. Some Roman citizens, often those in debt, sold themselves into gladiator schools for money. These free gladiators were called auctorati. There were also experienced and trained gladiators, referred to as veterani (veteranus), who were extremely valuable assets. The auctorati and the veterani were therefore treated completely differently to the noxii. A wounded veterani or auctorati would be afforded some dignity and care and would be carried from the arena on a stretcher. Only backstage would someone check if a veterani or auctorati gladiator was really dead. Once a gladiators body reached the Spoliarium it was stripped of weapons and armor. These valuable items were returned to to the dead gladiator’s lanista (trainer and owner) or to the Armamentarium. The Armamentarium would have been located near the Spoliarium and this was where the gladiator's arms and weapons were stored. No writers of the Roman period has actually documented the full horror of the Spoliarium. One can only guess at the terrible scenes were dead bodies must have been piled up surrounded by the stench and blood from the dead bodies. Dead animals were also disposed of via the Spoliarium. The Spoliarium - What happened to the dead bodies? No one can know for sure. Certainly many of the dead animals would have been sold to butchers of Rome and sold to the people of Rome or used to feed live animals which were to be shown in the Colosseum. But what happened to the dead bodies of the gladiators? It has been said that Romans believed that the blood of a dead gladiator had healing properties and could give greater sexual vigor. There is also the terrible possibility that their bodies were also fed to the animals (to give wild animals the taste for human flesh). Another method of disposal would be for the gladiators to be thrown into mass graves or into the River Tiber. The bodies of the veterani gladiators might be reclaimed and given a proper burial. Excavations at Ephesus in modern day Turkey have uncovered a gladiator's cemetery where a body would be laid in a sarcophagus that rested on the ground. The cemetery was discovered by accident in 1993. Epitaphs were very basic but occasionally detailed the fights a gladiator had won. The content of this Spoliarium category on death in the Roman Colosseum provides free educational details, facts and information for reference and research for schools, colleges and homework. Refer to the Colosseum Sitemap for a comprehensive search on interesting different categories containing the history, facts and information about Ancient Rome. Just like the subject of Spoliarium there is hardly a page of Roman history and the Romans that is not, on some way, connected to the Roman Colosseum which became a symbol of Rome, its society, culture and life.